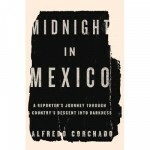 David is joined by Mexican-American journalist Alfredo Corchado to chat about his new book Midnight in Mexico: A Reporter’s Journey Through a Country’s Descent into Darkness. In the past six years, more than 80 thousand people have been murdered as a result of Mexico’s drug war. While most reporters steer clear of dangerous towns like Ciudad Juarez, Corchado has stayed and reports on issues like government corruption and crime which have eventually led him to reporting on the drug war, even if it is much to the chagrin of his family.